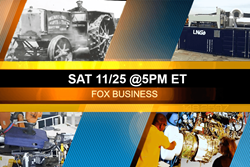 Award winning producers of Innovations with Ed Begley, Jr., proudly announce the airing of a new episode scheduled to broadcast on Saturday, November 25, 2017 @5:00pmET on FOX Business. Check your local listings for more info. This episode of Innovations will enlighten and entertain viewers on the latest breakthroughs in sustainability, manufacturing, technology, and more. First, the show will look at United Technologies’ dedication to sustainability, and how through good stewardship, the company is able to make environmental strides for the planet, while also benefitting employees, communities, customers and shareowners. Next, get a behind-the-scenes look at the Dresser-Rand business, a part of Siemens Power and Gas division. With advanced technologies that contribute to a more sustainable planet, the show will highlight how the company creates value. Traveling back to a simpler time, this segment will explore the history and evolution of technology on the farm as it tells the story of Harvey Firestone and Firestone Ag. Finally, Innovations will educate about Mino Automation’s unique engineering experience and ability to innovate, design, and provide state-of-the-art solutions and strategies. Audiences will see how these tools result in higher quality goods that generate larger returns, all while bringing safety to the workplace.